Strong woman Do Bong Soon Finale: Thanks for the laugh lines! There are happy endings that are satisfying and there are happy endings that just put you in a good mood, and I can say Strong Woman Do Bong Soon embodies both characteristics ten times over. There is something to be said about the chemistry of a cast, especially the leading couple, when the climax essentially occurred in the penultimate episode and the finale is basically an epilogue, yet it proves to be an enjoyable episode nonetheless. Though the drama presents its major plot points in a simplistic manner the finale reiterates the overarching point of this story in what felt like, at least to me a two episode or two part finale, as oppose to finagling the pacing so that Bong Soon finally catches the bad guy at the very last minute. Finally! The plan to find the psychopath of the hour Jang Hyuk starts by posting his picture plus any disguise he might be in everywhere, and I mean everywhere, Min Hyuk even had Jang Hyuk’s face pop up in his game for good measure. To be even more thorough Min Hyuk enlisted the help of his friendly neighborhood crime syndicate and Bong Soon set her delinquent disciples to power blog Jang Hyuk’s face into the minds of all who came across it. Through their efforts the two were able to successfully track Jang Hyuk’s activity. Knowing full well that the psycho refuses to be bested by a small girl, Bong Soon goads him into meeting her. He thinks he has the upper hand and brings a sniper rifle to the “showdown” but being alerted to the gun purchase by the crime boss, Bong Soon wears a bullet proof vest. It is crazy how this whole scenario is written in, but Jang Hyuk goes for a body shot as oppose to a head shot that would have spelled the end for Bong Soon and foiled the elaborate trap. Luckily things worked out as predicted and Bong Soon, Min Hyuk, and Gook Doo were able to trap Jang Hyuk in between two containers. Bong Soon, whom Jang Hyuk believed he killed, reappears and pelts him with walnuts, which probably felt as painful as being shot with huge BB guns. Jang Hyuk tries to make his escape once again, but the cat and mouse games come to a long awaited end when Bong Soon launches a cage that successfully traps him. Life pretty much goes back to normal after that. 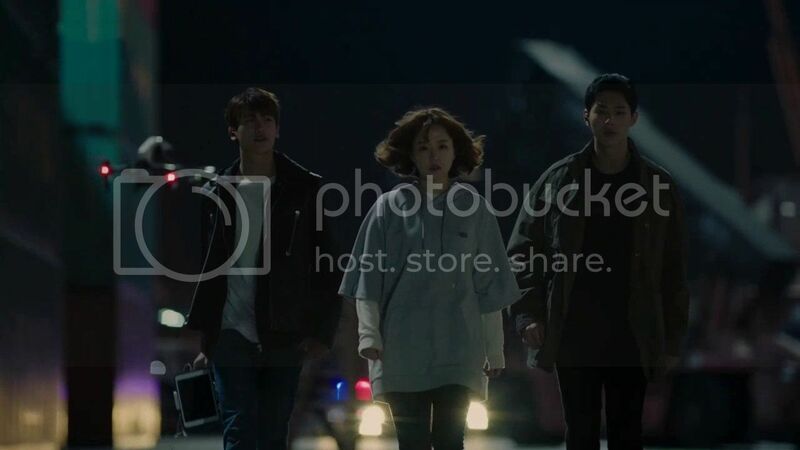 As the neighborhood rejoices over Jang Hyuk’s capture, Min Hyuk is forced to receive a “good citizen” reward on Bong Soon’s behalf in order to continue to hide her powers. An act she indicates he will have to perform more often from now on. We also found out Jang Hyuk’s motive behind his actions: he liked the power. He was able to make them do what he pleased due to fear and he reveled in it. Although I do appreciate the simplicity of the drama, I do wish we could have had a more complex villain with a better back story. However I do feel the writers didn’t want to stray too far from the lightheartedness and ease of the drama it wouldn’t hurt to have a villain who wasn’t evil just because he liked being the bad guy. Unfortunately his action, which he shows no remorse for, has mentally scarred many of his victims some of whom may be suffering from PTSD. The drama quickly moves passed its darker elements to focus on Bong Soon’s dream of fulfilling her dreams of becoming a game developer. She was successfully able to gain approval for game production and a spot on the strategy team. However after the game’s successful launch, working in the gaming industry began to take a back seat to her super hero activities, which got her booted from the strategy team. Min Hyuk, who was fully aware of her extracurricular activities didn’t seem too surprised or bothered to have his intern back. After all he pops the question not too long after and she gives him twin girls. The girls, who are also endowed with super strength, have proven to be more than just a handful since they are handing out black eyes like candy, their father included. All in all I thoroughly enjoyed this drama, and I will miss it. Although this drama still had its flaws, but the romance of Bong Bong and Min Min is really something worth watching. The level of PDA and openness is not often seen in dramas, maybe that’s why I couldn’t get enough. This is one of the better dramas that I have viewed this drama season and it’s sad to see it end. Previous articleStrong Woman Do Bong Soon swooniest moment yet! Yes! The chemistry was euphoric, you could get a contact high just from watching. I did feel a little bad for Gook Doo though, but sometimes you have to put yourself out there first and let your feelings be known. It worked for Min Hyuk, but I can also appreciate that Gook Doo wasn’t a total drama queen about the rejection and remained a good friend. Can’t deny the chemistry between PBY and PHS. That’s why I love SWDBS. There’s a genuine connection between the leading stars. I felt the love.